Sphinx Systems Limited is a Swiss-based manufacturer of high quality pistols used mainly by special forces, elite police units and sports shooters. Sphinx was founded in 1876, specializing in tooling and machining, and then diversified into the firearms industry during the 1980s. Sphinx is best known for its ongoing development of the original Czech designed CZ 75 pistol, which has been evolved into the Sphinx 2000, Sphinx 3000 custom competition pistol, and Sphinx SDP Compact. Sphinx started its work with pistols based on the CZ 75 design when they redesigned the ITM AT-84 licensed copy of the Czech CZ 75 and ITM AT-88, a first evolution of the CZ 75 that had been developed in Switzerland by ITM who later went out of business. In the past, Sphinx manufactured all pistols in Switzerland, slides are made from solid billet steel, frames from casts, forgings or also from billet, and fits each pistol with high quality barrels. Each pistol part is machined to extremely close tolerances and assembled by Sphinx master gunsmiths, which has given Sphinx the reputation for creating extremely accurate and reliable firearms. Past Sphinx pistols were not mass-produced and were hand fitted to tight tolerances, so Sphinx pistols were more expensive than mass-produced products. All custom-made Sphinx pistols except the AT380 are shipped with an actual test target, which confirms the accuracy of each pistol. In 2010 Sphinx joined KRISS Group and began production of the SDP Compact in 2012. The US-built SPD Compact, based largely on the 3000 Series, is Sphinx's first mass-produced firearm, which lowered the price by over 66%; partly due to Sphinx earning their ISO certification in 2013. Initial reviews have been very positive and the Sphinx SDP Compact has been featured in Combat Handguns, Recoil (which found it to be 25% more accurate than a full size CZ 75 SP-01), and more. Sphinx products were historically imported to the United States by SILE corporation, and until 2008 by SABRE Defense Industries. Since 2010, Sphinx products are being imported into the US by KRISS USA in Virginia Beach, VA.
Sphinx Systems AG was declared bankrupt on November 30, 2015. The parent company, KRISS Group SA, has been in financial trouble as well. KRISS USA, an independently operated subsidirary of KRISS Group SA, has since taken over the production and other business activities. Sphinx 3000 Duo-Tone in 9×19mm Parabellum with a stainless steel upper and a titanium lower frame intended for combat and target shooting. A sub-compact pistol. This pistol is highly accurate. 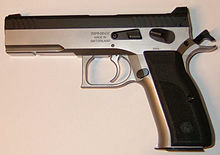 It is Double Action Only, which can slightly detract from the shooter's ability to produce tighter groupings; however, this pistol was not designed for competitive target shooting—DAO designs such as this have been shown to be easier to operate under stressful situations and therefore preferable to traditional Double Action designs when self-defense is concerned. Tolerances on this pistol are very tight and quality very high, as with all SPHINX pistols. Slightly smaller in general overall dimension than the Walther PPK/S, it also has a larger magazine capacity (10/11/15). The sights are adjustable. Safeties include: 1. an automatic firing-pin block type which precludes the striker from being hit unless the trigger is pulled, eliminating slam-fires etc. 2. Manual firing-pin block safeties on "M" models (similar in function to the Beretta 92F). This pistol is reported to prefer "hotter" ammunition in order to cycle properly until broken in. This is due to its European origin, where hotter ammunition (in comparison to the U.S.) is commonly produced & used. Due to tighter firearms trade restrictions, the AT .380 is no longer imported into the United States. A full- and medium-sized defense and sports pistol that shows its CZ 75/AT-88 heritage. A full- and medium-sized defense and sports CNC machined pistol made out of various metals such as stainless steel, aluminium and titanium. The Sphinx 3000 was designed as a modern combat pistol with features like a Picatinny accessory rail, a low bore line, extended magazine release, various safety system options, various finishes, sights, pistol sizes and materials to choose from. SubCompact (6.55"), Compact (7.40"), and Standard (8.19") size 9mm pistol introduced from 2013-2015. Mass-produced version of the 3000 Series. All models have a DA/SA trigger, ambidextrous decocker and a TIAIN-coated steel slide. Frame materials vary. Black, Krypton and Sand lines features hard anodized aluminum upper and lower frames, and weigh 29.06-29.72 oz (Compact). The Alpha line use hard anodized aluminum upper frame and polymer lower frames, and weigh 24.90 oz (SC), 28.18-28.39 oz (C), or 31.43 oz (Std). The Duo-Tone and Stainless Steel lines use all steel upper and lower frames (42.43-42.64 oz, Compact). The Compacts are also available with threaded barrels. All metal Compacts all have interchangeable polymer grips. Unlike its larger cousins, the SubCompact does not have interchangeable backstraps. It made its US debut during the first quarter of 2013 as the Compact Alpha model, followed in 2014 by other Compact mod els. SubCompact Alpha and Standard Alpha models were introduced in late 2014/early 2015. Although slated for manufacture, Standard and Production-sized models have yet to be imported into the US by the distributor, KRISS USA. Switzerland: "Kantonspolizei" (Canton law enforcement police) of Obwalden, Schaffhausen & Valais. However, Canton Valais has replaced the Sphinx 3000 pistols with the Heckler & Koch P30 in 2011, some municipal police forces are also using the Sphinx 3000 as their standard sidearm. The Kantonspolizei Obwalden use the Sphinx SDP Compact. The Sphinx 3000 is also in use with the BKW-FMB Betriebswache (security force) of the nuclear power plant in Muehleberg in the Canton of Bern. ^ "Waffenhersteller Kriss in großen wirtschaftlichen Schwierigkeiten - Deutsches Waffen Journal". www.dwj.de. ^ "BREAKING: Is Kriss Group (Swiss) Going Bankrupt? (UPDATE: KRISS USA to Takeover Swiss Business) -". The Firearm Blog. 25 April 2016. Retrieved 27 March 2019. ^ "PASKAU Malaysian Special Air Service Weapons". Military Factory. Retrieved April 14, 2016. Wikimedia Commons has media related to Sphinx pistols.